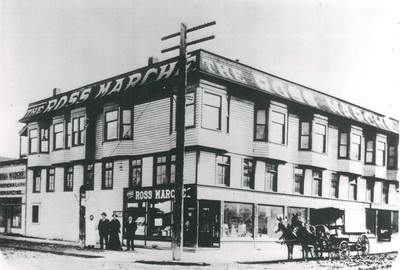 The Ross Marche Building, circa 1900, located at Third Ave West and West Bertona St. Copyright held by Seattle Pacific University. Contact SPU Library Archives for permissions: http://spu.edu/library/archives. The image is expected to no longer be copyrighted in the United States in 2020, though copyright could still apply outside the U.S. and has not been determined.